The KoolAir PM1000-115 Magnetic Drive Pump is most commonly used for marine air conditioning seawater circulation. 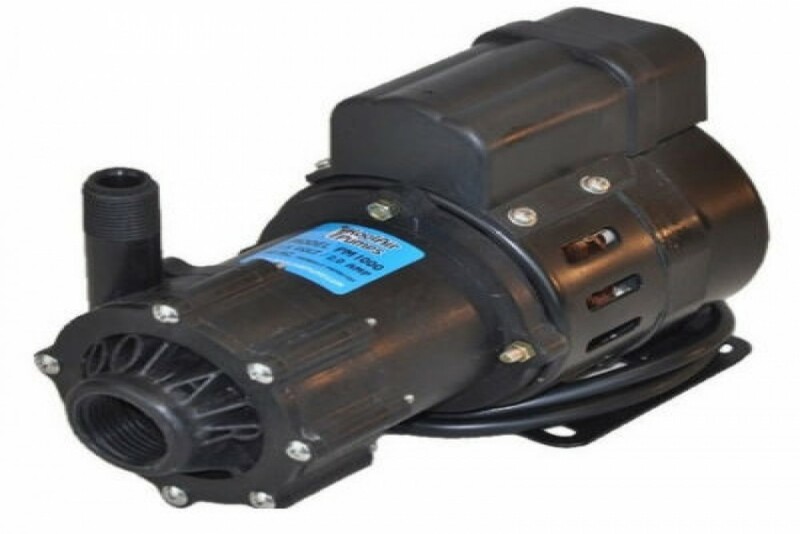 Replaces March AC-5C-MD Pump 115V, 1" FPT Inlet, 1/2" Outlet, 60 Hz, 115V, 1 Phase, 1/8 Hp, 3450 RPM, 17.2 GPM Max Flow, 27 Feet Max Head, 50 PSI Max Internal Pressure. The Koolair PM1000-115 & PM1000-230 ODP (Open Drip Proof Motor Enclosure Model) is a seal-less centrifugal magnetic pump drive (10 lbs.) generating a maximum flow of 17.2 gallons per minute with a maximum head of 27 feet at 11.7 PSI. Materials exposed to the solution (wet end) are Reinforced Polypropylene, Buna N, Cupro Nickel, Ceramic, and Ceramic Magnet. When submerged, Epoxy, Stainless Steel, Polysulfone, and the Cord will also come in contact with the solution. The inlet connection is a 1” female pipe thread and the outlet is ½” male pipe thread. Includes fully integrated, heavy duty, Epoxy coated marine base, as well as the original base. Maximum internal pressure is 50 PSI and the maximum liquid temperature is 130 Fahrenheit or 54 Celsius.